Adopted by the Faculty on May 23, 2008. Approved by the Board of Trustees on May 31, 2008. Union’s Faculty: The student-faculty ratio at Union is 10:1. Ninety-eight percent of the teaching faculty holds the doctorate or terminal degree (excluding library staff, some of whom hold faculty rank). Union’s Students: More than 6,600 apply for placement in the first-year class. Exact statistics vary from year to year, but approximately 67 percent of the applicants are in the top decile of their secondary school class. The majority of the College’s students are from the Northeast, with about 71 percent from New York and New England; 39 states and territories and 37 other countries also are represented. More than half receive financial aid from the College. About 87 percent of each class completes the degree requirements within six years. 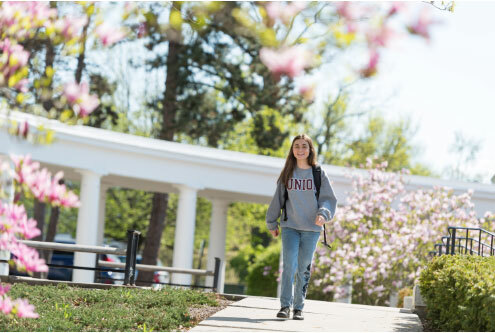 Enrollment: Union College enrolls approximately 2,132 full-time undergraduates. Accreditation: Union College is accredited by the Middle States Commission on Higher Education, 3624 Market St., Philadelphia, PA 19104, (267-284-5000). The College was last reaffirmed on November 19, 2015. The Middle States Commission on Higher Education is an institutional accrediting agency recognized by the U.S. Secretary of Education and the Council for Higher Education Accreditation. The programs in chemistry are certified by the American Chemical Society. The bioengineering, computer engineering, electrical engineering, and mechanical engineering programs are accredited by the Engineering Accreditation Commission of ABET, http://www.abet.org. The Board of Trustees: The governing body of the College is the Board of Trustees. The Board of Trustees holds title to the property, is responsible for the administration of the College and its funds, and determines the policies under which programs are offered. The chief executive officer is the president, who also serves as chancellor of Union University, comprising Union College, Albany Medical College (1839), Albany Law School (1851), Dudley Observatory (1852), and Albany College of Pharmacy (1881). Each institution has its own governing board and is responsible for its own programs. The Board of Governors of the University serves both to advise and to expand the areas of voluntary cooperation. Alumni: The College’s 27,000 alumni are represented by the Alumni Council, which is incorporated under the laws of the State of New York. The council has at least two representatives from each class, possibly more depending on the size of the class. It helps operate the alumni program through a group of standing committees and an executive committee, in conjunction with the Alumni Office. Alumni are welcome on campus every day of the year, with special emphasis on Homecoming and Family Weekend in the fall and ReUnion Weekend in late spring. ReUnions are held officially every five years, although all alumni are invited back to campus every year. Alumni clubs are organized wherever local alumni wish to use such an organization as a center of their college activity. The College’s quarterly magazine, Union College, is sent to all alumni and to parents of undergraduates. Union College traces its beginnings to 1779. Several hundred residents of northern New York, certain that Burgoyne’s defeat at Saratoga two years before would mean a new nation, began the first popular demand for higher education in America. These residents pursued that dream for 16 years until, in 1795, Union became the first college chartered by the Regents of the State of New York. The first trustees consciously attempted to bring their new college into the mainstream of their world. The very name, Union, carried echoes of the new national union. More immediately and directly, it recognized the fact that the College was an outgrowth of a new sense of community among the several religious and national groups in the local population. Union’s founders were determined to avoid the narrow sectarianism characteristic of earlier American colleges; today, Union is one of the oldest nondenominational colleges in the country. Union did not share the heavily classical bias of most colleges of the day. Its motto (“Sous les lois de Minerve nous devenons tous freres et soeurs,” or “We all become brothers and sisters under the laws of Minerva”) is significantly of French rather than Latin origin. Union was among the first to introduce French on an equal level with Greek and Latin. In the 1820s, when the classical curriculum was the most widely accepted field of study, Union introduced a bachelor’s degree with greater emphasis on history, science, modern languages, and mathematics. This liberality of educational vision characterized Union during the early years of the term of Eliphalet Nott, president from 1804 to 1866. Science and technology became important concerns; chemistry was taught before 1809, a degree in scientific studies was added, and in 1845 Union became the first liberal arts college to offer engineering. The College was one of the first to offer work in American history and constitutional government and did pioneer work in the elective system of study. By about 1830, Union was graduating as many students as any other college in America. Along with Harvard, Yale, and Princeton, it was spoken of as one of the big four. Students came from the South and West as well as the East. Among them were the father of Franklin D. Roosevelt, the grandfather of Winston Churchill, a president of the United States (Chester A. Arthur, Class of 1848), seven cabinet secretaries, 15 United States senators, 91 members of the House of Representatives, 13 governors, 50 important diplomats, more than 200 judges, 40 missionaries, 16 generals, and 90 college presidents, including the first presidents of the University of Illinois, the University of Iowa, the University of Michigan, Vassar College, Smith College, and Elmira College. Nott’s ingenious schemes for financing higher education, including a statewide lottery, also were instrumental in building Union’s reputation. Innovations under the leadership of Andrew Van Vranken Raymond, president from 1894 to 1907 include the establishment of a Department of Electrical Engineering and Applied Physics, headed by the “electrical wizard” of the General Electric Company, Charles P. Steinmetz. The new department gave impetus to the development of strong programs in science and technology and attracted attention and applications to the College. The 20th century brought other changes to Union. In 1970, the College adopted co-education and welcomed the first class of two dozen women transfer students. Today, roughly half of Union’s students are women. More recently, the College has added programs in Asian Studies, Bioengineering, Film Studies, Nanotechnology, and Neuroscience. In 2004, the Minervas were inaugurated to broaden the educational experience for students, faculty and staff. Every incoming student is assigned to one of seven Minerva Houses, joining upperclass students, faculty and staff in a house affiliation. Each Minerva, with its own budget and governing council, is a center for intellectual and social activity. Union’s fraternities and sororities continue a proud tradition of service. Theme Houses are a popular option for students who seek residential affiliation with others who are committed to themes such as community service, environmental awareness, art, music and language. The College has done important experimental work in interdepartmental studies, which is reflected in a number of programs that cut across the lines of academic disciplines. Organized interdepartmental majors are offered in numerous areas, and the College has also developed programs that enable students to work toward both a bachelor’s degree and an advanced degree. The Common Curriculum (General Education) has received national recognition, and the College has an innovative program of Writing Across the Curriculum. Efforts to renew and enhance the College’s academic programs and curricula continue to be supported by major foundations. The Union College campus, officially known as the College Grounds, occupies 100 acres in Schenectady, a city of 60,000 founded by the Dutch in 1661. The Grounds are the College’s third home. In 1813, shortly after the College decided to move to the new location, the French architect and landscape planner Joseph Ramée laid out the new campus - the first unified campus plan in America. He designed a great central courtyard, flanked on three sides by buildings and open to the west, with a round pantheon as the focus of the courtyard. The distinctive Ramée style, with its arches and pilasters in white, remains the dominant motif in Union College architecture. Recent additions have included the Feigenbaum Center for Visual Arts, Henle Dance Pavillion and the Wicker Wellness Center. Alumni Gymnasium, the Murray and Ruth Reamer Campus Center, and Schaffer Library have received major renovations and expansion, the historic Nott Memorial has been restored to become a display and discussion center, and a $25 million project revitalized the neighborhood to the immediate west of campus by creating apartment-style housing for 160 students, a community center, and a residence hall for 230 students. Other facilities include the Viniar Athletic Center, home of women’s and men’s basketball; the Taylor Music Center, a state-of-the art classroom, rehearsal and performance facility; Breazzano Fitness Center in Alumni Gymnasium; the new Center for Bioengineering and Computational Biology; and the opening of seven Minerva Houses: Beuth House, Breazzano House, Golub House, Green House, Messa House, Sorum House and Wold House. North of the central campus lie the eight acres of formal gardens and woodland known as Jackson’s Garden, begun in the 1830s by Captain Isaac Jackson of the Mathematics Department. Through the garden runs Hans Groot’s Kill, the brook that bounds through Union’s Grounds in the College song. A durable local legend, never confirmed by historians, holds that the villagers of Schenectady burned a local maiden at the stake there in 1672, and that the ghost of the dead girl has haunted Jackson’s Garden ever since. At the center of the Grounds, on the spot designated by Ramée for his pantheon, stands Union’s most unusual building, the distinctive, 16-sided Nott Memorial. Begun in the 1850s and completed in 1875, it has been hailed by architectural historians as an important example of American Victorian architecture and is a National Historic Landmark. Facing the Nott Memorial is Memorial Chapel, built in 1925 as a monument to the Union College graduates who lost their lives in World War I. Along its walls hang portraits of the former presidents of the College. Memorial Chapel is home to the renowned Union College Concert Series, which presents the world’s finest chamber musicians. It also serves as the venue for major College convocations. Also near the center of campus is Schaffer Library, which not only houses an extensive collection but also provides comfortable and modern space for reading, research and collaborative study. The library staff offers support for research and teaching in a variety of ways including in-class presentations, individual consultations, online research guides and informal inquires at the reference desk. The Schaffer Library provides access to electronic books, journals and databases, while on campus or off, 24 hours a day . Special Collections and Archives holds several of the College’s most prized possessions, including an elephant folio edition of Audubon’s Birds of America, which the College purchased directly from the artist; the Trianon editions of William Blake’s works; the first books bought for the library in 1796; and the original College charter. The Library also houses the Union College Permanent Collection of fine art and scientific instruments. The collection includes over 2,800 works of art and material culture, including significant resources from internationally recognized artists and objects from Eastern and Ancient cultures. The collection also includes the original Ramée drawings for the campus and the Olivier Models. The Artist Installation Series is in the Learning Commons and Union’s fine art collection is on display throughout the library. There is always an interesting exhibition of the College’s treasures on display in the Lally Reading Room and the Beuth Atrium. Flanking the library and connected to it by a curved colonnade are Karp Hall and Lippman Hall. Karp Hall is the home for the Departments of English and Modern Languages. Lippman Hall, named in honor of Robert Lippman ‘50 through a gift by his son, Jim ‘79, houses Economics, History, Political Science and Sociology. On nearby South Lane, Lamont House is the home of Anthropology, Classics, Philosophy and Religious Studies programs. Filling the area in front of the library and between the two classroom buildings is Roger Hull Plaza (named for the former Union president), an open space with benches and flower beds. This campus crossroads was furnished and landscaped in part with gifts from parents of Union College students. It serves as the site for such formal ceremonies as Commencement and for informal meetings and conversation. The Science and Engineering complex, which includes the Science and Engineering Building, Bailey Hall, Steinmetz Hall and Butterfield Hall, is the home of the Departments of Biological Sciences, Chemistry,Computer Science, Electrical and Computer Engineering, Mathematics, Mechanical Engineering, Physics and Psychology. Mathematics and Psychology are in Bailey Hall, Computer Science in Steinmetz Hall, and Bioengineering and Neuroscience in Butterfield Hall. In this complex, and available for student use, are such research tools as a nuclear magnetic resonance spectrometer, a Pelletron accelerator, X-ray diffraction equipment, a centrifuge, and a scanning electron microscope capable of examining a surface area 200,000 times smaller than what can be seen with a conventional light microscope. The nearby F.W. Olin Center’s interactive computerization capabilities make the building adaptable for use by nearly every academic department and student. The Geology Department is located here, and, in addition to a variety of collaborative computer classrooms and laboratories, the center has a multi-media auditorium and a 20-inch, remote-controlled telescope. The Peter Irving Wold Center for Science and Engineering was made possible by a gift from John Wold ‘38. The interdisciplinary Center serves as a platform for learning, research and innovation which solidifies the College’s role as a national leader in the integration of science, engineering and the liberal arts. The three-story 35,000-square-foot research and education facility houses space for interdisciplinary programs such as Biochemistry, Environmental Science and Engineering, a high performance computer lab, state-of-the-art laboratories and classrooms, and flexible incubator labs for leading edge interdisciplinary research. Recent additions to Wold include labs for robotics and 3-D printing. The Feigenbaum Center for Visual Arts is in North Colonnade in the former Philosophical Hall, which held the first analytical chemistry laboratory specifically opened for college students, and is home to the Department of Visual Arts. Also in the North Colonnade, is the Taylor Music Center which includes the Fred L. Emerson Auditorium, a performance and teaching space with state-of- the-art recording technology. Surrounding the performance hall are practice rooms, high-tech classrooms and faculty offices. The Yulman Theater and Henle Dance Pavilion, overlooking Jackson’s Garden, complete the performing arts facilities. The focal point of the Murray and Ruth Reamer Campus Center is a commons area, part of a multi-level atrium that extends to a patio overlooking Jackson’s Garden. The building also houses an auditorium, a dining hall, food court, a two-level bookstore, and a variety of office and activity rooms for student organizations such as Concordiensis, the student newspaper; WRUC, the first radio station to offer regularly scheduled broadcasts; The Garnet, the yearbook; the literary magazine, Idol; and the student activities office. Alumni Gymnasium houses Breazzano Fitness Center, made possible by a gift from David Breazzano ‘78, a spacious facility with an extensive assortment of equipment for cardio fitness and weight training. The building also has an eight-lane swimming pool with seating and a diving area; racquetball/squash courts; and multi-use rooms for dance, aerobics and yoga programs. Achilles Center houses Messa Rink, the renovation of which was made possible by a gift from Frank Messa ‘73, as well as athletic training and strength and conditioning programs. Old Chapel, the former chapel and student meeting hall, is still used for many meetings. South College, built in 1814, contains Sorum House and Green House, two of the College’s Minerva Houses. North College, its counterpart on the other side of Library Field, is the home of Messa House and Wold House. Beuth House, Breazzano House and Golub House complete the Minerva House system. Other residence halls are Davidson and Fox Houses, West College, Richmond House, Raymond House, Potter House, College Park Hall, Garnet Commons and apartments along Seward Place to the west of campus.